The Co:Here project at 1st and Victoria is nearing completion after many years of planning and fund-raising; people should start moving in as early as September. Urban churches are sitting on some of the priciest real estate in the province, and they’re using the situation to their advantage. Churches are wisely making their land holdings work for them by partnering with developers to boost revenues and, in some cases, provide affordable housing. Over the past couple of weeks I’ve visited some of the church sites that are under development, just to see what state they are in. Pastor Tim Dickau at the ground-breaking ceremony. In various places in the Bible, we find this vision of a society where everyone has a home – which is an especially significant dream, given that the Hebrew people in the Bible were for long periods landless and homeless. One of the marks of the early church was that they took those abandoned and homeless folk in the Roman empire and invited them to live with them. 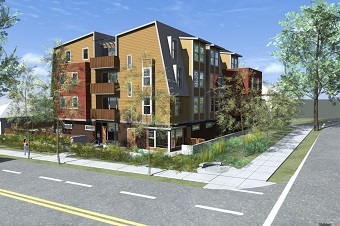 The Co:Here housing project is part of this ongoing story and shares this same vision. From the time we began discussing how to utilize the lot we purchased next to our parking lot back in 2002, the focus has been on providing a home for those in our neighbourhood who are without a home, a stable home. Co:Here is a partnership between Grandview Calvary and Salsbury Community Society, which grew out of the church and now operates affordable supportive housing communities and educates and nurtures those living in intentional community. An artist’s rendering of the Co:Here building being constructed at 1st and Victoria. To facilitate a sense of community, equality, mutual care and companionship, the building includes 2,335 sq ft of community space (kitchen, living room, dining room and meditation / quiet room); 2,690 sq ft of outdoor space for urban agriculture; and 340 sq ft of office space for its care-centred staff and organizational partners. Of particular importance is the arrangement of self-contained apartments around ‘pods’ of shared space on the 2nd, 3rd and 4th floors. Occupancy of the Co:Here building is expected early this fall. 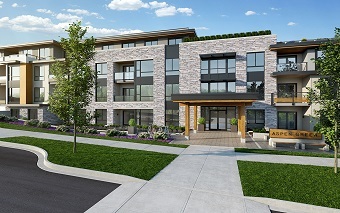 Aspen Green will join several other seniors housing complexes just east of Rupert Street. 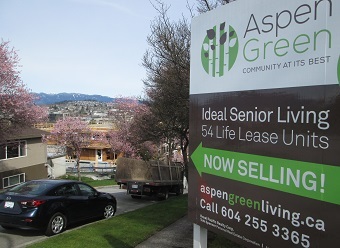 Aspen Green will join the not-so-small world of seniors housing which takes up the full block below (east of) Rupert Street between 4th and 5th, with connected projects north of 4th and south of 5th. Like Grandview Calvary / Salsbury / Co:Here, Aspen Green is affiliated with the Canadian Baptists of Western Canada (CBWC) (though it is not tied to any one particular church). Beulah Garden Homes (BG Homes) was founded in 1951 to provide affordable housing for seniors. . . . The community is currently made up of the Cedars Assisted Living (opened in 2008), Beechwood Residence (opened in 2006), Charles Bentall Residence (opened in 1991) and the Rupert Residence (opened in 1964). After many years of diligent work and prayers, construction has begun on Aspen Green, which will be the newest seniors’ residence to join the community. This is the way Aspen Green is expected to look when completed in November. 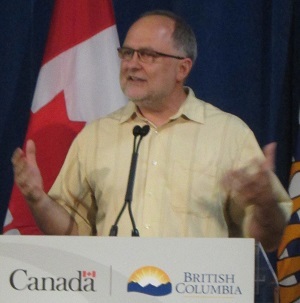 With a group of local housing advocates having released An Affordable Housing Plan for BC April 10, this is a good time to take note of the major role already being played by Christian non-profits. Along with Beulah Garden Homes, groups such as More Than a Roof, Baptist Housing, Elim Village, 127 Society for Housing, Salvation Army Senior Care, Roman Catholic Homes, Fair Haven Seniors Housing, Broadway Pentecostal Lodge, St. Jude’s Anglican Home and others provide thousands of housing units for seniors and vulnerable people. Much like the families who founded Vancouver Christian School back in the 1930s and 40s, the current VCS community has been praying for a permanent Vancouver home for our K – 12 students for more than 10 years. About two years ago, we began a process with the City of Vancouver, applying for a development permit for our school site, on Mons Drive [between Rupert and Boundary, several blocks south, and up the hill, from Grandview Highway]. Much prayer, hard work, volunteer time and expertise was invested in the endeavour, with the end result that we received approval for our permit in May of 2014. Vancouver Christian School, once it’s completed. While all of us have been busy dealing with the weather challenges of the last two months, significant work has been happening on the Mons Drive site. Fast forward through the dramatic demolition and steady pace of clean-up, and today the project is well into the excavation and foundation-building phase. The new kindergarten to grade 12 school is projected to be completed by the end of the year. 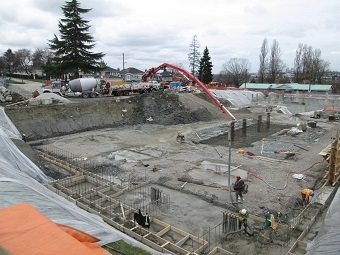 In January, K – 6 will begin in the new building, while high school will continue at Carver Christian High School in Burnaby; in September 2018, there will be a fully operational K – 12 school, including Carver students. Go here for a six-minute virtual tour of what the new facility might look like. Central Presbyterian Church is undertaking a major project on its property in the downtown core. Apparently it will still be just over a year before the congregation of Central Presbyterian Church will be able to move back to its old haunts, but the construction is already several floors high. And when church members do begin to meet in the new building on Thurlow near Davie in the West End, it will feel very different from the old one. When construction is completed . 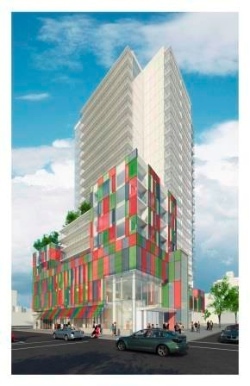 . . a 22-storey multi-use building will occupy the site. Central will move into a three-storey podium along with a daycare, various community facilities and commercial retail space. Above the podium will be a tower containing 168 market rental units. This project, which includes space for Central Presbyterian Church, is due to be completed in early 2018. 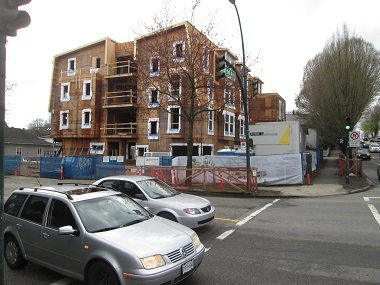 The corner of 60th and Cambie is where the Church of God in Vancouver stood for years; it will be part of the new buildings, one block south (left) on 61st. The Church of God in Vancouver (originally known as South Cambie Gospel Hall) met in a modest church building at the corner of 60th and Cambie from 1958 until a couple of years ago. Church of God in Vancouver will use the bottom floor of this complex, once it is built. 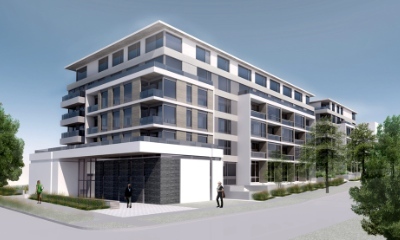 In the next few months our current site will be demolished and a new development of rentable condos will be built on the 60th and 61st block of Cambie, including our community church which will have a beautiful, modern space built into the complex. We want to reassure the people of the South Cambie, Marpole and Langara neighbourhood, and further afield, we are still going to be committed to making sure that the redevelopment is utilized to build a stronger and more supportive community in what is becoming a new urban hub for Vancouver. 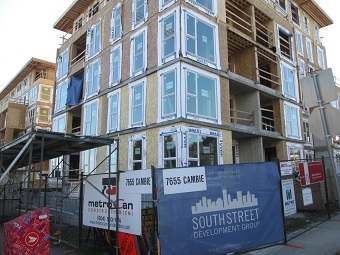 We’re really excited about what’s happening in the Cambie Corridor and how the South Cambie area is developing. We are committed to being a community church – building up and supporting the neighbourhood; providing a space for people to meet, events for people to get involved in together and services that enrich the community life of the area. For more of the story, including the church’s unique background, go here. The church will be part of the new building, on the ground floor at the corner of 61st and Cambie (that is, one block south of its old location). 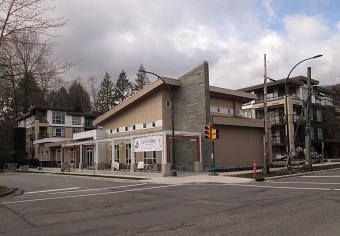 The new Lynn Valley United Church development has been warmly received by the District of North Vancouver. 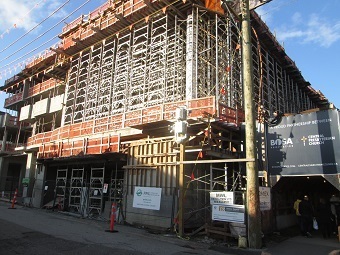 Lynn Valley United Church has partnered with Marcon Developments to redevelop into a smaller church building and transform the current parking lot into a four-storey, 75-unit condo building. The 65-year-old building was in need of repair, and with a shrinking congregation, it had to reinvent itself. The church set up a redevelopment committee that approached the developer, and together they figured out a plan to build a new church facility and create an endowment fund for the congregation. For Marcon development manager Nic Paolella, the idea to partner with a church was unusual, but intriguing. . . Transforming an aging church into a magnificent community facility and at the time providing affordable homes to the young, elderly and disabled is indeed a feat to be proud of. The District has a policy of retaining and sustaining institutional use for the long-term benefits of its residents. I think this has certainly been achieved through this development; a win-win partnership. 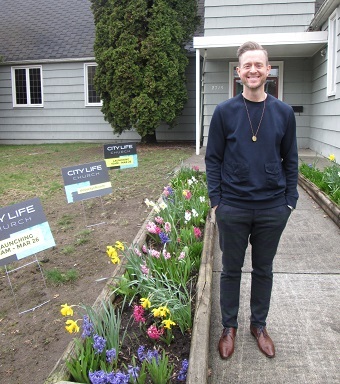 Pastor Todd Lueck in front of City Life’s new home. One church property that will not be developed right away is that of the former Westpointe Christian Church in Kitsilano, just east of MacDonald on 12th. In this case, the lack of development is good news, given that it had been sold to developers by Westpointe. So, I was surprised when I arrived to take pictures, to see signs large and small saying City Life Church. Then I was fortunate enough to meet Todd Lueck, pastor of the young church, who explained how that came to be. 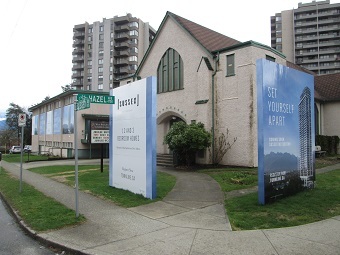 The bad news is that the property has been lost to the larger Church of Vancouver in the long run (see my Vancouver’s lost churches); the good news is that City Life Church has a one year lease, and just began meeting there a couple of weeks ago. Todd, his wife Stephanie and their two children moved from their home church in Chilliwack to Vancouver last summer. After having some problems with their first meeting place, they have settled into their new home with a strong sense that they are in the right place. May their stay last longer than expected. West Burnaby (now part of Jubilee) United Church will be redeveloped by 2019. Several other churches are moving towards development. Just a couple of days ago the Vancouver Courier ran this story about Corpus Christi Catholic Church in the Killarney area: Church sale: leveraging land value to pay for a new school. Others to keep an eye on are First Baptist Church in the downtown core; Dunbar Ryerson United Church in Kerrisdale; Bethlehem Lutheran Church just east of Main Street; Oakridge United Church; Oakridge Lutheran Church; and West Burnaby United Church (now part of Jubilee United Church) near Metrotown in Burnaby. ← Around Town: Testament, Way of the Cross Walk, Ecological Stations . . . Encouraging to see the Christian churches providing affordable housing. I’d also like to see churches and some of these developments offering amenities/space for art and culture, ie theatre, workshop space etc.